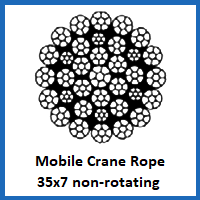 Take advantage of the rotation resistant properties of our mobile crane rope 35×7 non-rotating construction wire rope for mobile cranes and tackle whatever heavy-duty lifting tasks are on your schedule with confidence. Select the length and diameter you need and contact us using the details below for a quote. Mobile crane lifting comes with a few requirements in terms of the type of wire rope you should use. Our 35×7 construction rope is able to avoid rotating when under load, as well as providing a good amount of overall durability so that it will not be easily crushed or warped by any forces that are exerted on its exterior. The diameter of the rope you choose will determine its minimum breaking load. For the smallest 28mm wire rope, that figure will be 760.8kN. For the sturdiest 48mm wire rope, that figure will be 2236kN. Galvanisation prevents early damage caused by corrosion from occurring, and this mobile crane rope is endowed with a long lasting steel core to go along with its durable outer wire construction. Also bear in mind that all lifting equipment must be checked to ensure safety before use. This mobile crane rope also comes in a 24×7 construction but cast your eye over our wire rope for container cranes, ship cranes and overhead cranes to see the breadth of our range. For prices on any of our crane rope products, or to talk to someone about what you might need for a specific hosting application, just get in touch with us. Use our email form for a quick reply, or call us direct on 01384 78004. 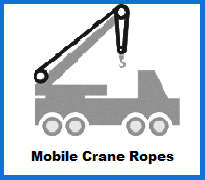 Mobile Crane Rope 35x7 Non-Rotating Construction Overall rating: 5 out of 5 based on 6 reviews.